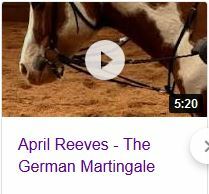 This is a post I said I would never write, but it came to my on my Facebook page (https://www.facebook.com/#!/pages/April-Reeves-Horse-Training-Questions-Answers/192644566518?fref=ts). I save this information for my clinics, mainly because it’s better understood when you SEE it as well. However, this question does merit this information, and I always say, I may not be here tomorrow, so I will say it all today. These are also trade secrets that my clinic participants usually get to hear. Enjoy and I hope you gain from them! Question: YAY! thank you! I have an 8 yr old mare, mustang cross., her name is HotLipz (she has a flame on her nose) She has a history of abuse and had severe trust issues when I first got her just over 2 years ago. I got her from the feedlot, just hours before she was to be shipped. She has come so far since then in learning to love and trust. She is super sensitive and needs to have a relationship before she will trust, so not just anyone can work with her. She needs lots of Patience and love. I’d like to take it a step further and be able to ride her. She is like 2 different horses. On the ground she is soft and calm and trusting. When someone is sitting in the saddle she can now tolerate it but once things get moving she falls apart. Sometimes big, sometimes not so big, its hard to predict. We have broken it down to the tiniest of steps for her. Rewarding the good behaviors, head down, relaxation, licking chewing breathing, with clicker training and carrots. She seems to make progress then something happens(and we can’t pinpoint what it might be that sets her off, something internal maybe, a click of self preservation?) and she reverts backwards to needing us to start all over again. I have contacted an animal communicator, animal empath, used essestial oils, massage, flower essences, calming supplements etc.. We have actually made a lot of progress together but seem to be stuck with the rider piece. She can walk on a loose lead anywhere with me and not worry, like holding hands with my best friend. We have a very strong connection. Any suggestions? If you need more info let me know! I have lots of pics on my page: SerendipityFarm and Studio. Thanks so much for any advice you can offer! I really enjoyed reading your blog and thought maybe there is hope after all. I don’t want to give up on her. Don’t give up on her. What I think she needs is just a different approach. While love and patience is important, what’s more important are the ways you ask her to step up and do something, and those things must come through to her as patience and love. Those two virtues are nothing without some form of “question”. 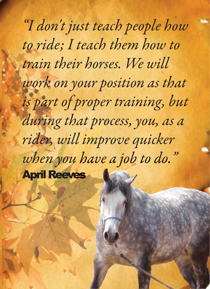 Subscribe to April Reeves Horse Training Q&A's and be first to read new posts and training tips! Be the first to know of any Clinics in your area! Send your email address and where you are located to: aprilreeves17 @ gmail.com. 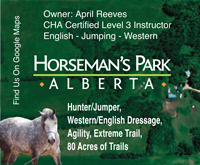 If April Reeves is in your area, we will notify you first, before the clinic is announced!